Note that apple green tip should occur app. 101 DD (Base 43.) Based on the SkyBit forecast, which goes out to 4/23, 101 DD's are predicted to accumulate by 19-April (this upcoming Saturday-Sunday). We'll see. Ed. note: we reached McIntosh green tip somewhere between April 18 (104 DD's) and April 19(114 DD's) so the prediction was quite good! *note that the flower buds are not swelling, they are winter injured and will not produce fruit; although a closer look is warranted, there are some buds swelling on these PF-14's, however, there are many dead flower buds too. • If you receive this Healthy Fruit (HF) you most likely have subscribed for the 2015 season. If you get this and you know or think you have not re-subscribed, please go to the UMass Extension Bookstore (http://umassextensionbookstore.com) and purchase a new 2015 subscription to HF ($50, e-mail delivery only). Alternately, you can send me (Jon Clements, 393 Sabin St., Belchertown, MA 01007) a check for $50 made out to 'University of Massachusetts.' Make sure you note it is for Healthy Fruit subscription, and includes your e-mail address. You can also use this mail-in form to order Healthy Fruit and other UMass fruit publications. • We reached McIntosh green tip at the UMass Orchard on Sunday, April 19. A major scab infection period would be underway if there were mature spores to be released from the leaf litter, however, it's likely there are not too many. Orchards should have been covered with copper prior to this wetting, and that should give some scab control if there is anything out there. A wet week looms ahead, so it's likely many orchards will be starting to cover-up with protectant fungicides over the next few days. See Diseases for a more detailed discussion of what's going on with scab now. Other than that, it's going to be pretty hard to get too much done this week given the wet weather, so be sure and come to our Fruit Twilight Meetings! 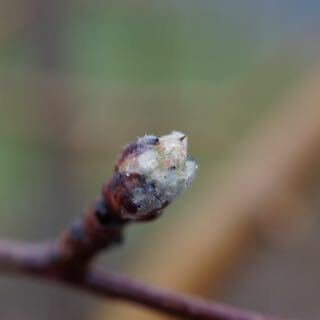 Please see Guest Article -- Pre-Bloom Problems for a discussion of scale and a few other insect pests that might be dealt with at this time. See April 7 Healthy Fruit (http://healthyfruit.info/hf040815ell466.html) if you want more information about the procedures we are using. On 4/20 we brought in a fresh batch of scabby leaves from the outdoor collection of scabby leaves (Belchertown). We wetted the leaves and placed them in the indoor funnel spores trap for 20 min. RESULT: No spores were seen. On 4/20, we ran a petri plate assay with cut sections of 6 scabby leaves from the same outdoor collection for 2 hours and then examined the 2 slides. RESULT: No ascospores were seen. On 4/20 we also performed squash mounts on 10 overwintered fruiting structures (pseudothecia) plucked from 6 leaves to evaluate maturation of ascal sacs and the spores they contain. RESULT: All 10 pseudothecia had some ascal sacs that contained mature ascospores. The percentage of mature ascal sacs (versus immature) rose in one week from 50% to 72%. The "squashing" of the preparation caused some of these sacs to rupture, releasing spores into the drop of water. It is doubtful that many of these spores would have released on their own, though there were a few asci that did release spores without pressure. 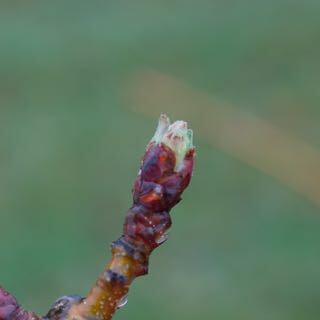 The scab model on the NEWA (http://newa.cornell.edu) website estimated 2% spore maturity at Belchertown early today (4/20). (See below.) It predicts (based on weather forecasts on 4/20) that Belchertown will reach 4% by Sunday (4/26). RIMpro estimates slightly lower maturity, with less than 1% today, and 3% Sunday. (See below.) SkyBit estimates zero (no) mature spores as of today. 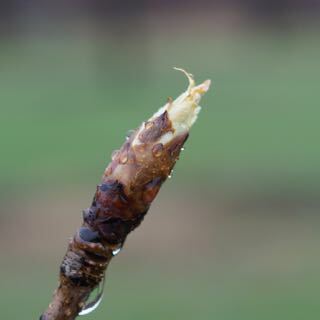 The 'Mac' trees in Belchertown were at green tip on Sunday (4/19), and with this wet weather, the beginning of spore release is imminent, though percentages will be very low over the next week. “Clean” blocks identified by doing PAD analysis last fall do not need to apply fungicides targeting scab this week. We still would recommend copper applications targeting fire blight. These will also control scab for up to 7 days depending on rainfall. In blocks where apple scab was not evaluated or where it is known to be above the PAD threshold, a standard scab fungicide should be added to the copper. At this time of year, a low rate of Penncozeb, Manzate, Dithane or other registered mancozeb, Captan, Scala or Vangard are recommended. Obviously, scab resistant cultivars do not need to be treated with a scab fungicide, but copper is still recommended for fire blight. 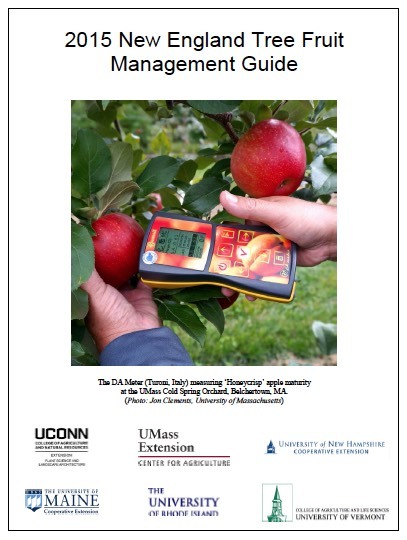 Also, please note our experimental New England Apple Decision Support System maps, http://fruit.umext.umass.edu/zedx/index.html. It should be pretty self-explanatory, and should only be used to get a feeling how the scab season is progressing regionally, and the forecast scab risk during the upcoming 7 days to help you plan your scab management fungicide spray(s). It should be updated daily, however be sure to check the most recent update date as the forecast changes daily. Just before bloom arrives, fire blight will be added to the maps, as well as codling moth when the time is appropriate. Your questions or comments are welcome. 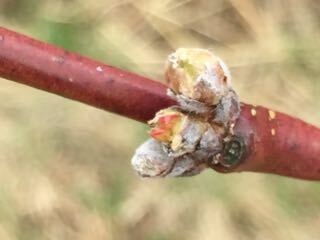 I have not done a complete inspection, but clearly here at the UMass Orchard a lot of peach flower buds were damaged by the mid-winter cold. Damage is evident by the fact the flower buds are not swelling. No doubt there will be some peaches, and I would generally plan to prune as normal, however, consider the fact there will not be a large peach crop. It may turn out to be adequate, but that depends. I would be curious as to what you are seeing? 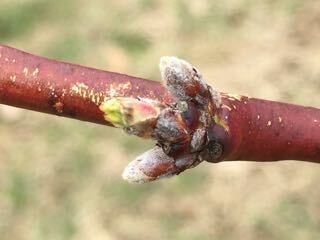 These peach flower buds are not swollen at all, they will not flower, and there will be no fruit here. This is 'PF-14 Jersey. 'Varieties will differ substantially on the amount of flower bud damage observed. The upper flower bud may be OK, the lower bud is not swelling. I would estimate that 10 to 25% of the flower buds are OK, the rest have been winter damaged. This should still result in a peach crop, however, stay tuned. The few balmy days we had last week may not have represented the actual arrival of true spring weather, but they did provide the opportunity to consider the value of some welltimed pest management decisions, directed especially at some of our more challenging insect pest species. Pre-bloom is by far the most opportune timeto manage SJS. The overwintering immature stages, protected beneath the waxy covering, are least protected from a spray application, as the developing foliage increases 'spray shadowing' as the season progresses. A most effective timing during this period is delayed dormant, from the time silver tip begins to 1/2" green. We are all familiar with the use of horticultural oil, Lorsban, Supracide or Esteem 35WP directed against overwintered "black caps" during this period, as these are longtime standard control measures. In low to moderate population levels, horticultural oil alone in a 2% dormant application or a 1% green tip (GT) application, applied to infested trees with complete coverage, has been shown to control this pest. In moderate to high populations, the oil should be applied in combination with other effective insecticides. Supracide 25WP can only be applied during the prebloom (delayed dormant) period of apple, as stated on the label. and borer management every other year. Remember, the earlier the application against the overwintering black cap phase, the greater the likelihood of success. Coverage is critical in scale management, requiring a slow travel speed (<2.5 MPH), low wind speed (<5 MPH) and as close to a dilute application as possible. Increased foliage equates to "shadowing" and reduced coverage, which of course is the essential control component against the overwintering life stage. Softer insecticides, such as Esteem 35WP (pyriproxyfen) can be employed with or without oil, acting against the pest as an insect growth regulator (IGR), a unique mode of action for use against the immature scale. As the insect matures, the insecticide acts as a juvenile hormone analog to reduce the insect's capacity to molt. Centaur 0.7WDG (buprofezin), also an IGR, does require a penetrating non-ionic surfactant such as 0.25% v/v oil to be effective. Be aware that Movento (spirotetramat), a systemic insecticide, cannot be used pre-bloom as per label restrictions. Movento has been found to be most effective after PF in one to two applications, when there is sufficient foliage for effective uptake, and requires a penetrating non-ionic surfactant. Incompatibility concerns over captan use in early pest management programs for apple scab can be a formidable barrier when considering the use of oil. The possibility of phytotoxicity when using captan near oil applications should be strongly considered when searching for a weather window as an opportunity for SJS management. New England will most likely be P. prunicola. Infestations on apple as well as peach are characterized by numerous white scales that cluster on the trunk and scaffolds, giving them a whitewashed appearance (see photo). Feeding reduces tree vigor, and foliage of affected trees may become sparse and yellow; heavy infestations can cause death of twigs, branches and entire trees if left unattended. This species overwinters as an adult female and deposits eggs in the spring. Horticultural oil is recommended as a dormant spray in April, and insecticides can be used against crawlers in mid-June through early July (about 700–1150 DD base 50°F from March 1). Materials such as Movento or Centaur would be two good candidates at such a time. [Refs: Johnson & Lyon 1988, Insects that Feed on Trees and Shrubs; Davidson et al. 1983. Proc. Entomol. Soc. Wash. 85: 753-761). 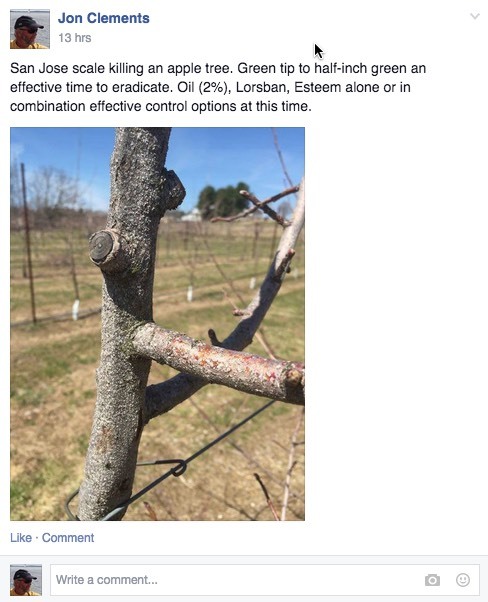 There is increasing concern throughout the Northeast about damage being caused to apple trees by borers. The species of primary concern is dogwood borer, but American plum borer can be prevalent in western New York apple orchards that are close to tart cherry and peach orchards. From our observations, DWB is very prevalent throughout many of the Eastern as well as Western NY orchards with young plantings. While we do not yet have a complete picture of the effects of these borers on dwarf trees, we do know that they reduce vigor and can, in time, completely girdle and kill trees. We have tested a number of insecticides against these borers over a number of growing seasons. Lorsban is very effective for this use and we have urged growers to take advantage of it where needed. In the past, we have compared some other materials, including white latex paint and a series of alternative insecticides against Lorsban, with varying results. To make a long story short, only Avaunt, Danitol and, possibly Esteem, applied two or three times in midsummer, provided control comparable to one application of Lorsban. Our tests have shown that borers can be controlled season-long by applying Lorsban at various times in the spring and summer. While a postbloom trunk application of Lorsban is still allowed, enabling growers to spray at the peak of the dogwood borer flight, applying this material prebloom as early as half-inch green works well, too, and may be more convenient. Fall also may be a good time to control dogwood borer. Results from 2002 indicated that Lorsban applied postharvest the previous year (sprays went on in October 2001) controlled both the overwintering and the summer generations of dogwood borer. An October 2002 application of Lorsban similarly provided season- long control of dogwood borer in 2003. Lorsban works when applied in the spring or fall because it infiltrates burrknot tissue and kills larvae concealed within. It is also very persistent in wood so it continues to work for a considerable time after it is applied (apparently 9–12 months in our trials). Fall application may offer growers a more convenient alternative for applying borer control sprays. Recall that current Lorsban label restrictions allow only ONE application of any chlorpyrifos product in apples, whether as a foliar or trunk spray, so these recommendations pertain only if no earlier applications have been made. Bear in mind that we now also have a mating disruption option available, Isomate-DWB, which we have found to be very effective in interfering with these insects' pheromone communication process. Use of this product would be recommended as a tactic in mid-May to early-June, before the first adult catch of the season. borer may be a different story in orchards near tart cherry or peach trees.) A number of orchards in which we have conducted borer control trials have never had mouseguards and there is no shortage of dogwood borers in them. If mouseguards are deteriorated and no longer protect the tree, there may be some small advantage, in terms of borers, to removing them. But, in orchards where mouseguards still provide protection against rodents, removing them for the sake of borer control is probably not worth the risk. Instead, we would recommend the use of trunk sprays to control borers. Even with mouseguards on, insecticides will give adequate control if they are applied carefully (i.e., a coarse, low-pressure, soaking spray with a handgun). The recent emergence of black stem borer (Xylosandrus germanus) as a cryptic but devastating pest of apple trees in our region has focused more attention on early spring insect activity that could have serious consequences for tree health as the season progresses. 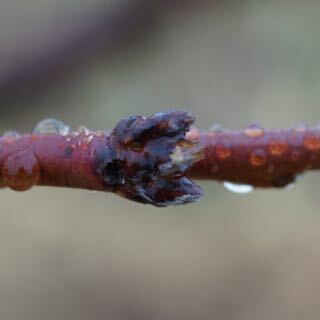 Although we do not have sufficient experience in dealing with this insect to make reliable control recommendations, we would note that growers considering the use of Lorsban trunk sprays against San Jose scale and/or dogwood borer at this time may also see some benefit against ambrosia beetles, particularly in trees that might be under stress from flooding or cold injury. The next Healthy Fruit will be published on Tuesday, April 28 or thereabouts, 2015. As always feel free to get in touch with any member of the UMass Fruit Team (http://extension.umass.edu/fruitadvisor/team-members) if you have questions or comments.